First, let me get to the directions. If you’re an experienced candy maker or home baker, this is pretty straightforward albeit labour intensive. Make Espresso Biscuits following Martha Stewart’s recipe. I scooped the dough into tablespoon-size balls and flattened them into round disks before baking. The recipe yields 39 cookies. Let the cookies cool completely before proceeding. Make Liddabit Sweets’ Marshmallow with some modifications. Instead of vanilla, I dissolved 3 teaspoons of instant espresso powder when blooming gelatin. Cook the syrup to 255F for a stiffer marshmallow that is easier to pipe. Similar to their recipe, you only need half of the marshmallow for piping so prepare a baking pan to pour the extra for snacking. 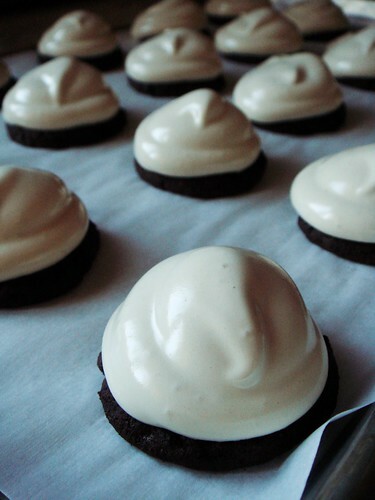 Once you fill your piping bag with marshmallow cream, you’re ready to assemble the cookies. Pipe a small dab on each cookie and set a malted milk ball on top. 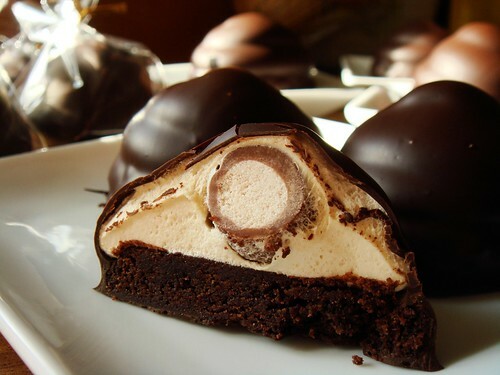 Pipe a generous swirl surrounding the malted milk ball and let the marshmallow cream set to dry overnight. Temper a pound of dark chocolate (I used 62%) and cool it down with about another 1/4 pound of seeds. Enrobe all the cookies. 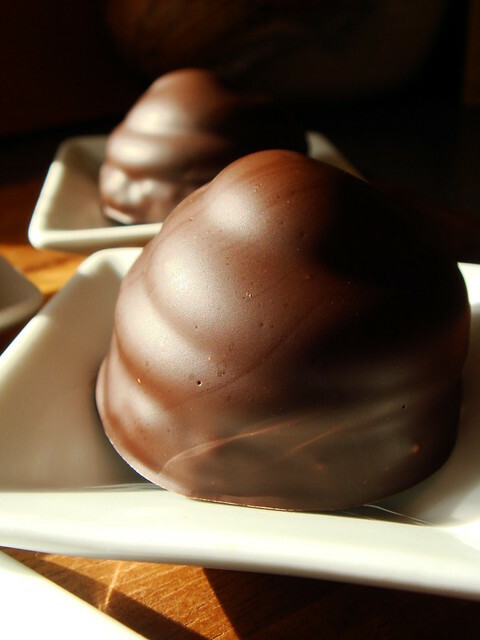 The crunchy malted milk ball surprise added a fun textural contrast to the delicate treat. The soft cookies and fluffy marshmallow filling offered one-two punch of coffee goodness without being overwhelming. 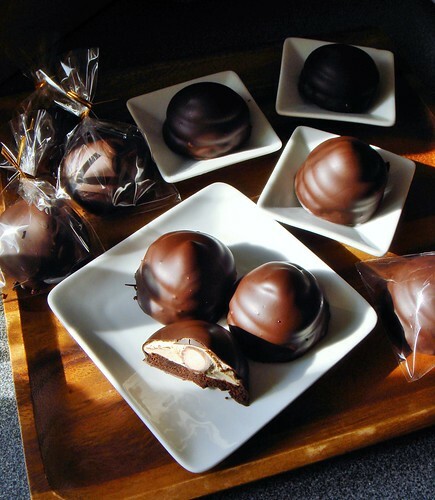 These Mocha Mallomars Surprise tastes like a childhood favourite all grown up. Just in time for Halloween! I like them a lot and so do my taste testers. 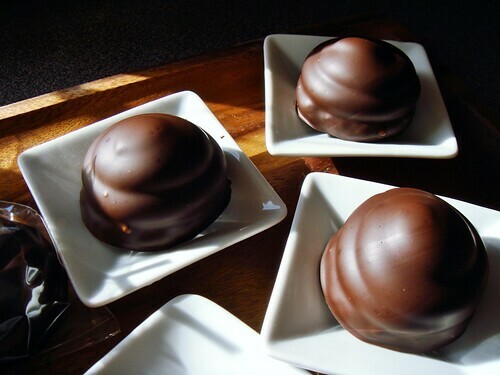 The concept of a Mallomars lends itself easily to many different variations. I have several other flavour combinations that I cannot wait to experiment in the next few weeks.